I think you are really going to like these stunning pieces by Elemental Otherworld on Etsy. They're dark, mystical, and powerful. Take a look at all these amazing prints! 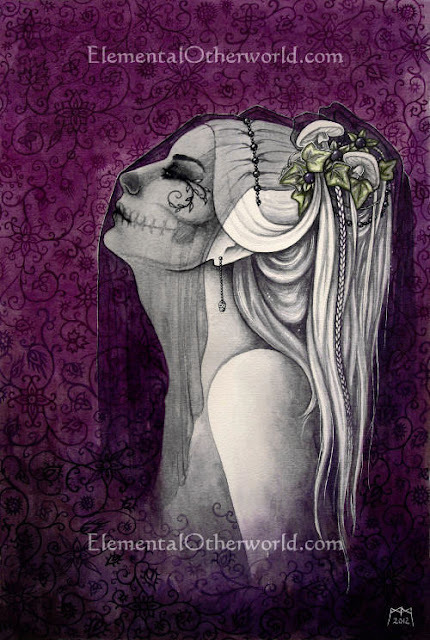 When I saw this Sugar Skull Gothic art I was stunned. This sugar skull bride is absolutely gorgeous. I love the black veil over her pale face. I am impressed with this amazing piece of the Goddess of the Underworld. 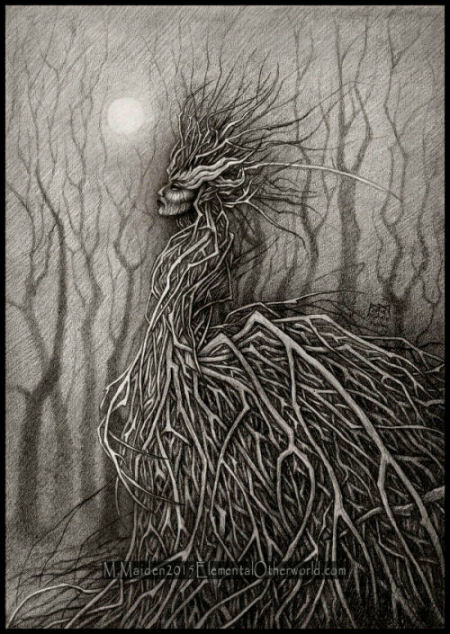 This Persephone print shows her dark and nurturing side as skeletons and feathers hang from the growing branches from her head. I love the personification in this Of the Cold Earth print. She represents the harsh and dark days of winter. I can actually hear the rasping, thorny veins crawling up her neck. Even her strong jawline shows her jarring personality. 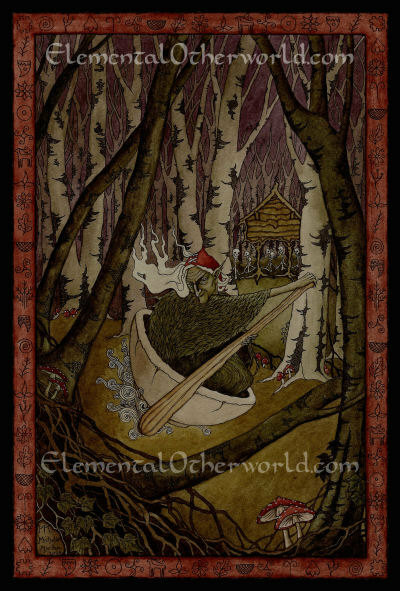 The murky environment for this Baba Yaga illustration is sinister. The old hag has a very malevolent grin on her face, it's creepy! If you didn't know who this Goddess was, this Sekhmet print might mislead you. I do enjoy this more disturbing aspect of her fierce personality. 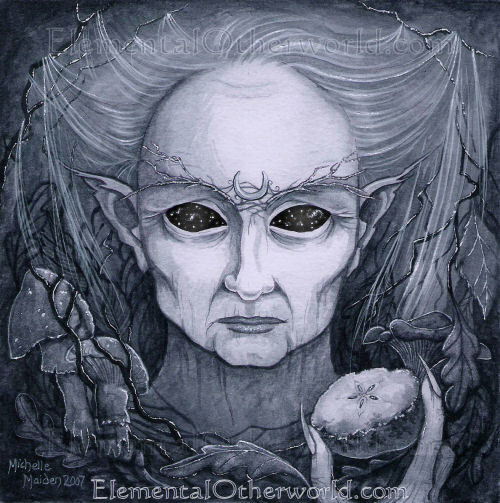 Did you notice that the Crone's hair in this Winter Crone print looks like a veil? Perhaps this is a symbol for death? 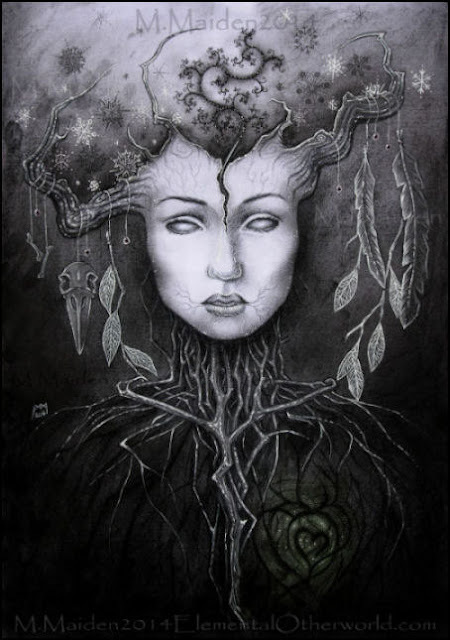 You can see past the veil through the crone's eyes. This is a powerful piece! 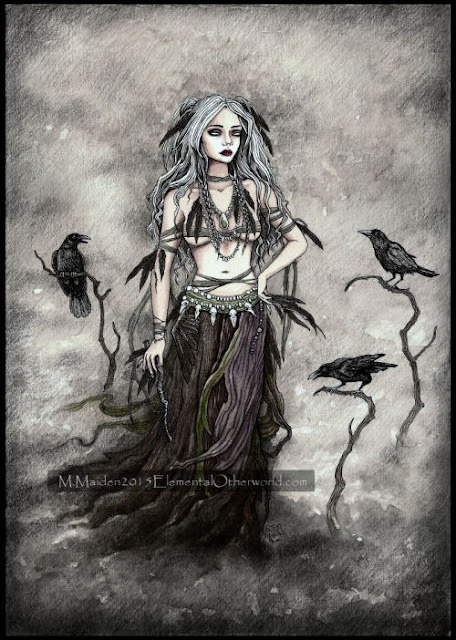 I think that this Crow Witch illustration would be great for a card. I could send a bunch of friends and even distant family short little messages with this beautiful witch on the front. It would be unique for Halloween too! 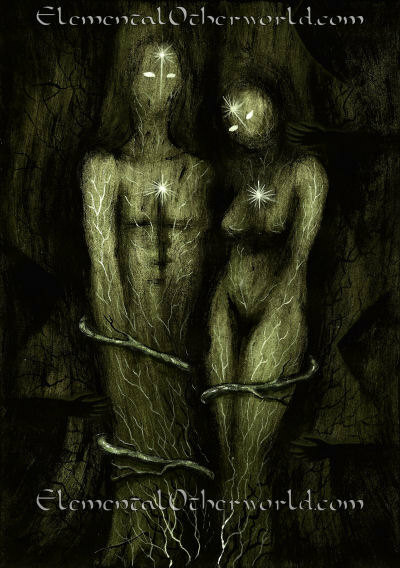 I love how in Ask and Embla print humans were born in what looks like darkness. It's a beautiful and unique piece. It is very obvious that they are born from trees and earth. The These Fragile Fleeting Days illustration is a true representation of our lives! Death is always looming over us and it's something we will never escape. It shows how our bodies are more delicate than what we expect. 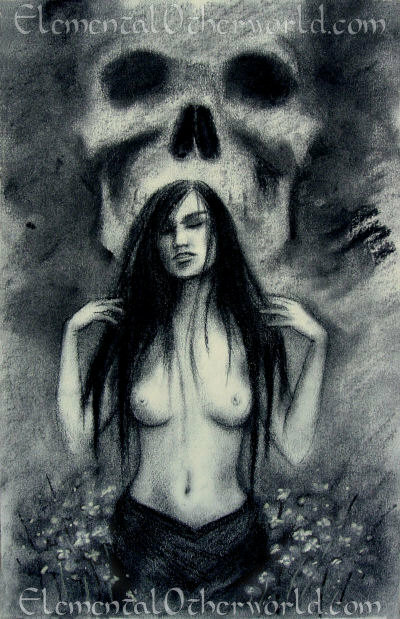 This is a delightfully dark illustration of the stunning Freyja. 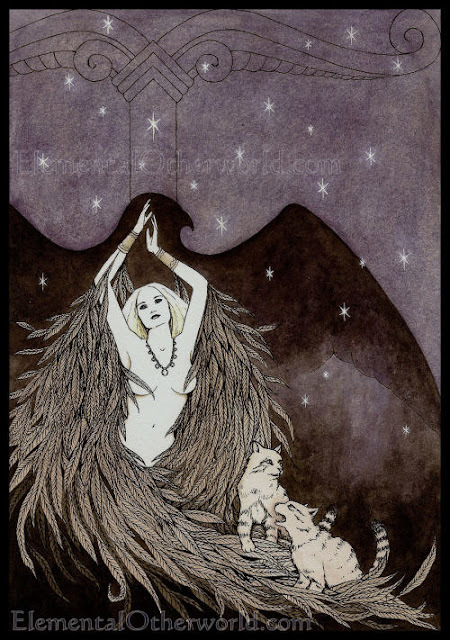 Freya features cats playing on her cloak made of the feathers of falcons. I'm wondering why there aren't pigs or boars in this piece. 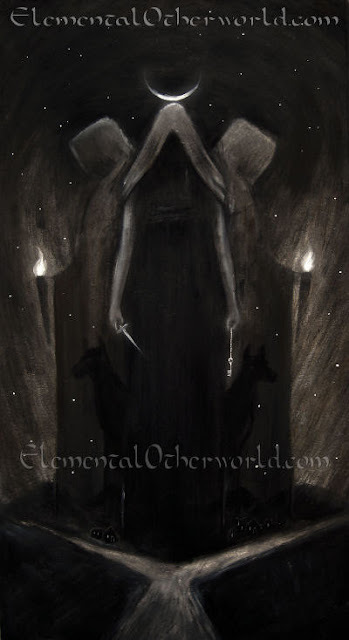 This is an eerie representation of Hecate the Goddess of magic and the crossroads, This is the version where I can see her walking through ancient cemeteries in the middle of a luminous night. I haven't seen anything like this Queen of Sticks painting. it's oddly glorious and very creepy. You can actually the shape of a gorgeous Victorian style dress made out of sticks. 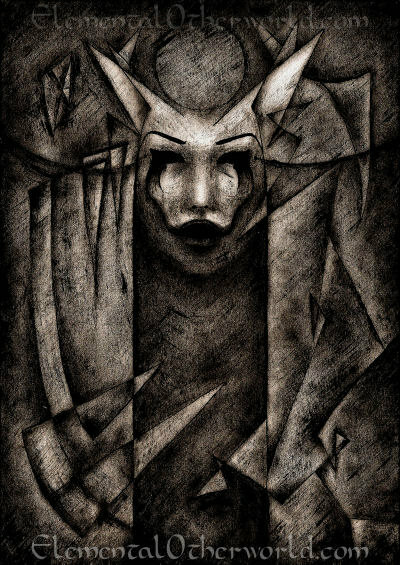 Tell me what you think of these ominous pictures by Elemental Otherworld on Etsy. 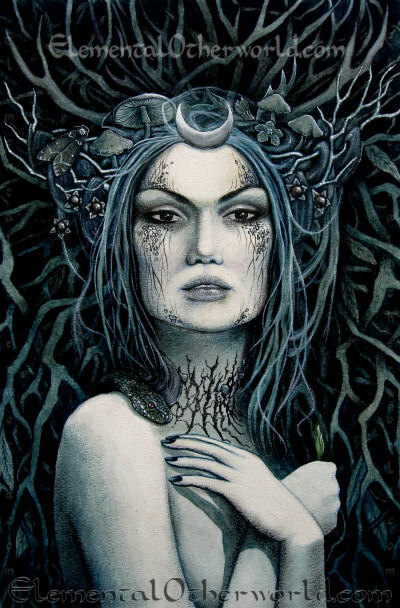 I love the dark interpretations of famous Goddesses in different cultures. Which one do you like the most? Make sure to comment below!